From the beginning, my desire to make cheese was rooted more in a desire to find a way to preserve milk I might actually have in excess at my farm than any other thing. That is, I never set out to make true Cheddar or Ricotta. Instead, I want to make Innisfree cheese using time-tested methods. So far, my effort has been a mixed bag, partly because I’m not listening to what the milk is telling me. On the other hand, I have learned a lot from the mistakes I’ve made and have a much better idea of how to proceed. For me, moving forward means going back to what started me down this path, and that means rereading Sandor Katz‘s excelled writing on the subject. His approach is fundamentally what I am trying to do, and I’m working to reapply his simplicity to what I am doing. If you are interested, I highly recommend his book Wild Fermentation (affiliate link). It is simple, straight-forward, and an excellent primer for anyone looking to make a variety of fermented foods, including cheese. 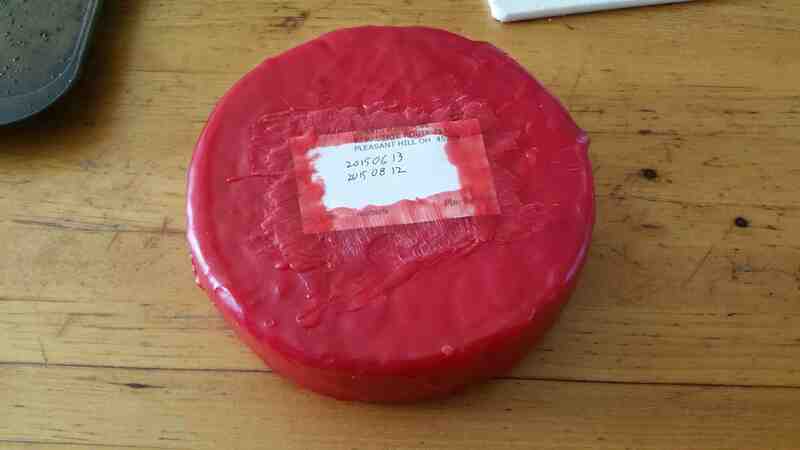 I started making my own cheese about six months ago, and today, I waxed my first hard cheese to age. It is a farmhouse cheddar based on the recipe from the New England Cheese Supply Company. This wheel will be ready about the middle of August if all goes well. What I’ve discovered so far is both how easy cheese making is and how tasty the results can be. I start with raw milk I get from our herd share. Most of the time, I make a simple queso blanco (recipe below), but now I am branching out into hard, aged cheeses, mostly because they last longer and spread the cheese making out some. Start with at least two gallons of whole milk. If you’re using store bought milk and want a heavier cheese, add cream to achieve the desired consistency. The more cream in the milk, the denser and wetter the cheese will be. I use the wholest milk for ricotta-like curds and the skimmedest milk for making a hardened grating cheese all based on this recipe. Heat the milk to 185F. Some people add salt at around 175F. I don’t and haven’t noticed a difference. Add 1 cup of apple cider vinegar for roughly every two gallons. I actually use three cups for four gallons of whole raw milk. You can also use lemon juice or citric acid. The internet is full of ratios, but don’t be afraid to experiment. Remove from the heat and let stand for 10-15 minutes to allow enough time for full curd separation. Pour off the whey. Be careful, it is really hot! Strain the curds through a cheese cloth in a colander until they stop dripping. If you want wetter curds, let them drain less. If you want dryer curds, squeeze the cheese cloth lightly to remove excess moisture. Pour the curds into a bowl and add around 1 tablespoon of salt per two gallons of milk. I salt to taste, which can involve as many as four tablespoons for four gallons. My rule of thumb is just saltier than you think it should taste. It will mellow. If you want to press your cheese, I recommend a small cheese form. I press it five pounds per side, flipping it once, then ten pounds per side, flipping it once. Wet curds will last about a week in the fridge. Dry curds will last about ten days in the fridge. The pressed wheel lasts about a month in the fridge. If you want a really, really dry, sharp cheese that is good for grating onto salads and things, used the skimmedest milk to make the cheese, press the curds into a wheel, let it continue to drain in the fridge for a few days, then continue to dry it by dusting the surface with salt and placing it in a bag until the cheese is the consistency of Parmesan. It turns out we’ve all got to eat, and it’s probably no surprise to anyone who knows me that I have a few things to say about the undertaking. Hence this food blog. My goal is to focus on the preparation of food from locally grown, sustainable ingredients as well as the science, history, and folklore behind food, especially foods that many people consider ingredients and don’t think about making themselves. In addition, I will post interesting food related tidbits as the mood hits me.